SALT LAKE CITY, October 25. /TASS/. There is a possibility to organize the meeting between Russian presidential aide Vladislav Surkov and US Special Representative for Ukraine Kurt Volker, Russian Ambassador to the US Anatoly Antonov told reporters on Thursday. "There is a possibility for a meeting between Surkov and Volker. They remain in contact. The time and place of the meeting are being coordinated," Antonov said. "Out task is to make this meeting effective. We support the settlement in Donbass in accordance with the Minsk Agreements. It is time for Ukrainian partners to fulfill their obligations," he added. The ambassador noted that "no concrete steps are being done." 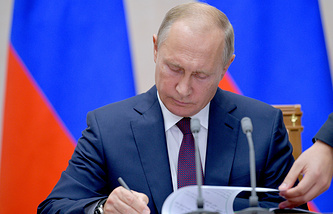 "We have concrete proposals that were put forward by [Russian President] Vladimir Putin," he noted adding that it is not clear whether the meeting will be held this year.